Based in Melbourne, Dan Milne is a type and graphic designer who also teaches at Monash University. In January 2019 Retype released Dan's type family Tasman which he first developed ten years prior, as his graduation project during a masters in type design at (KABK) the Royal Academy of Art in The Hague. Designed by an Australian while living in the Netherlands, Tasman borrows its name from Abel Tasman, a Dutch explorer who mapped parts of Australia in 1642. In Retype's press release to mark the launch founder Ramiro Espinoza described the face as "a sturdy, warm type family that is neither mechanical nor fragile." It is indeed robust but what first struck me about Tasman's forms was the masterful balance of being both strong and subtle. Tasman has authority (& strength of voice) while maintaining a softness (and the warmth Espinoza described) from its calligraphic origins (a hallmark in many of KABK graduate's designs). Dan first conceived Tasman as a typeface for newspapers. He writes "Typefaces intended for news require a certain personality. They deliver the news, which can be serious, joyous and catastrophic on the same page. When designing Tasman, I aimed to keep the personality as warm and playful as possible without losing the tone required to deliver all kinds of news." Dan undertook extensive research to ensure Tasman was fit for purpose. There are many constraints when designing type for newspapers. The low quality (& bleed) of newsprint, the speed of press operation, the economy of space all challenge legibility. While the diversity of the content means tone, colour, pace are all critical. Dan designed around all these considerations in Tasman's form. A key source of inspiration was The Guardian's redesign. Where Paul Barnes and Christian Schwartz developed both serif and sans serif type families, specifically for use with new high-speed printing presses. "The Guardian typefaces are a stunning example of type designed for a particular purpose and of the potency of the custom typeface as a branding tool." Tasman delivers all this too... Its shape grammar has gravity and power that speaks to truth, reliability or perhaps more aptly trustworthiness. These are fundamental qualities in the delivery of information in an "alternative fact" age. But it has broader appeal. Dan writes that Tasman is "Striving for neutrality over elegance" and while I dont believe this is in any way a neutral design, (in that it has a distinctive voice) I do think Tasman presents as unbiased, steadfast and highly functional. I would subscribe to any news source typeset in this family. But Tasman should not to be constrained by its Newsprint origins. It works beautifully for reading on screen. Trust is something all brands aspire to build, and many non-fiction authors crave credibility. Tasman feels human, confident and sure. Making its authoritative, easy reading forms, a sound choice for so many applications. I know I look forward to using it in my book design work. I asked Dan to share more about his design process (& journey to date). Can you tell us a little about the highlights of your career history so far? And what led you to Study at KABK? Like many type designers, I began with an undergraduate course in graphic design. By the end of the course I was thoroughly consumed by typography and I should probably credit Robert Bringhurst with instilling in me a deep respect for type and its creators. In relative isolation, I fumbled my way through making a typeface as an honours project, learning mostly from books but also from Wendy Ellerton, a former colleague at Monash University, who had recently spent a year at KABK. I graduated from KABK in 2009 and since then most of my practice has been in type design. I've worked regularly with Paul Barnes and Commercial Type on large projects for newspapers and magazines. In between, I've worked on custom typefaces for local clients, artists and institutions. On reflection, I have probably not dedicated enough time to building a library of my own self-initiated typefaces. It is becoming a bit of a reoccurring theme with type designers and typographers I profile on TypographHer.com - what do your parents think of (or understand about) your career choice? In hindsight, my career in design and teaching was probably more predetermined than I'd like to think. Both of my parents were educators and Dad was a programmer from the earliest days of computing so he appreciated the need for fonts and their constant adaptation to new technology. I inherited a tendency for systems thinking and naturally gravitated towards the systematic end of design. Type design requires you to attend to the tiniest of details while reading how this small decision here will come to bear upon thousands of other glyphs within the type family. Ten years in the making, how did ReType's recent release of Tasman differ to or expand upon your grad project version and subsequent earlier iterations? Tasman first emerged as a three-weight family in 2009, the result of an intense, five-month graduation project. The typefaces were complete enough to clearly express my intention but far from being ready for commercial release. 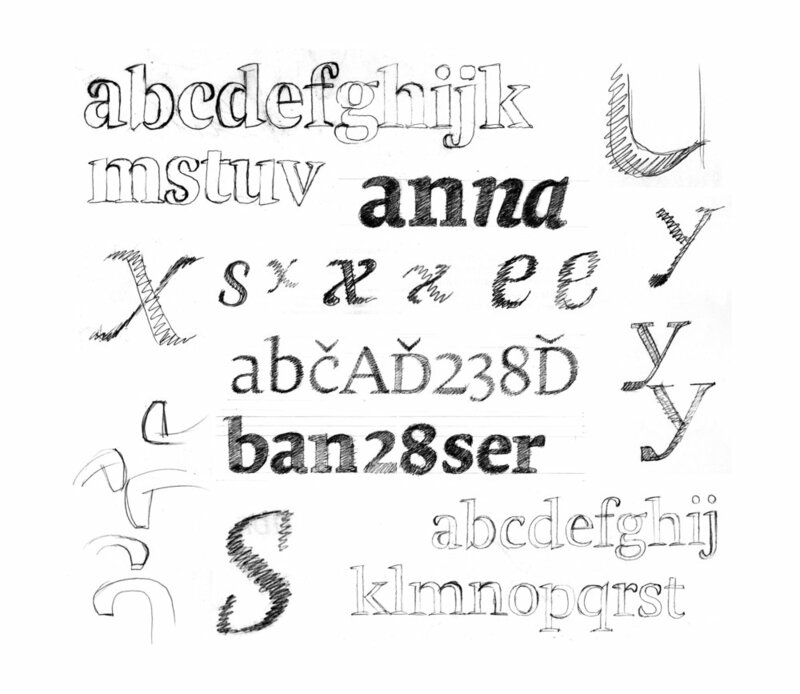 After OurType expressed interest in releasing the family, I filled out the glyph sets and handed over masters in 2011. OurType mastered the fonts in-house, which included expanding and fine-tuning the weight range, building additional language support and rekerning the family. I was consulted along the way and I was grateful for the many hours they put into the fonts, but I think this process, which stretched over a long period, distanced me from the final release. I have always been impressed with Ramiro's ability to promote type and Tasman's re-release by Re-Type in association with Type Network has meant a thorough checkup, polish and another passionate round of promotion, which has injected fresh energy into the family. This process has led to some minor technical improvements, but the weight distribution and spacing remain the same. You wrote in your 2009 type specimen that analogue sketching did not form a large part of the development of Tasman. Yet it does have distinctive qualities of the pen and calligraphy! How did your KABK training with drawing, penmanship and letter carving inform Tasman's design? The TypeMedia Masters at KABK is a year-long immersion in writing and the course is underpinned by Gerrit Noordzij's theory that typographic forms are essentially derived from the stroke of the pen. It's this underlying connection to writing which makes so many diverse typefaces instantly recognisable as KABK graduation projects. For Tasman, I was keen to explore the humanist oldstyle model. Oldstyle typefaces are not a traditional choice for news, but they can be very space-efficient and they are lively -- two qualities I was seeking in my project. Tobias Frere-Jones had recently made the case for oldstyles with his empirically-proven Poynter series. The spirit of the pen is definitely alive in Tasman, but by the time it was being drawn I think I'd developed enough intuition for how the weight should be distributed that I only rarely needed to pick up the brush. When I did, it was to help resolve subtleties like the tail of an oldstyle five or an ampersand. What are your favourite features in Tasman? Ten years on, I'm still very pleased with Tasman's personality. I've made a lot of typefaces in the meantime, but I still fall back on Tasman as my day-to-day default. It's compact, warm and without fuss and probably represents me the best of all of the typefaces I've made. It would be interesting to make a collection of first typefaces. I think they probably have a quality which is somewhat diminished in a designer's later projects. They are often the result of intense focus and a reflective and questioning approach to drawing. They are full of optimism, full of ideas -- perhaps too many ideas -- and they are possibly the most accurate portrayal of a type designer's personality. To be honest, Im not sure if I'll ever get into that first typeface zone again... cloistered away in a foreign land without any distractions. I don't think my family would let me get away with it these days! Given the Guardian was a source for inspiration and it has both serif and sans styles can we expect a sans serif pairing for Tasman in the future? In 2010, I worked with Commercial Type to develop Phoenix Sans, a custom typeface for the University of Phoenix. The typeface was initially conceived as a humanist sanserif companion to Tasman, but over the course of the project it developed an independent personality. When the university's exclusive license ends in 2020, I suspect the typeface might be reborn as Tasman Sans. What are you working on right now and how has Tasman informed your current work? In recent months I've been working with Paul Barnes to develop display styles for Darby News, the latest addition to Commercial Type's ever-expanding Darby family. Having worked on sans, poster and text styles in the past, I'm pretty familiar with the design's intention. A customised version of Darby News was originally developed in 2017 for the Italian La Repubblica newspaper. I've been working on news faces with Paul Barnes pretty regularly since graduating with Tasman in 2009. This week I've been drawing a custom typeface for Melbourne artist Emily Floyd, based on the masthead of a 1971 edition of Hungarian literary magazine Tiszatáj. The type will be lasercut in mild steel as part of an art installation as well as being used for large-scale letterpress printing. It's refreshing to be working with some unusual technical constraints! What do you learn from teaching? Teaching a craft forces you to reflect on it and distill it in your mind. When you first start teaching you tend to over-enthusiastically focus on details and practicalities. After some years, you are able to distill most of what you teach into a broad language of patterns and this is where teaching becomes most valuable for your own practice. Finally, I love your choice of name and its nod to both the Netherlands and down under. I would love to hear more about how where you live (or being an Australian) informs your work? I'm regularly asked if I can identify an Australian style and I'm not convinced that I can. Broadly speaking, I think globalisation and the ever-increasing flood of images on the internet has acted to dilute and prevent any recognisable modern Australian style from emerging. I also acknowledge that any style which does exist is much more recognisable from outside. I live in an old mudbrick home in Eltham with gumtrees overhead and ringtail possums in the eaves. This is a distinctly local style of architecture and I hope that the same might emerge in my own design work. Perhaps I just need to disconnect! Tasman is a suite of feature-rich OpenType fonts fully equipped to tackle complex, professional typography in a range of settings. The character set includes small caps, fractions, case-sensitive forms, bullets, arrows, special quotes, and nine sets of numerals. Besides standard Latin, its extensive character set supports Central European, Baltic, and Turkish languages.